The mask does not hide. Unravel. The theatrical mask involves a dynamic relationship with the actor. Alone, the mask is an object, a magnificent object of art. It reveals the epiphany of an identity, it reveals its appearance. It needs the actor to come to life, to breathe. And the actor must put himself at the service of the mask, he must grasp its vital dimension, its rhythm, its weight, its breathing. To wear a mask, the actor must learn to change, to metamorphize, to modify his body and his voice. The actor must learn to read the lines, the volumes, the planes of the mask to transform himself. It is the mask that requires the appropriateness of the transformation. The mask invites the actor to seek physical and corporal essentiality, to meet with it. The mask is like a text that gives us the sensitive coordinates of a human being. We must learn to read them. For an actor, knowing how to wear a mask means approaching his work through a physical and non-psychological attitude, reaching the construction of the character through a matrix linked to breathing, weight and the density of movement. Finally, this is an organic approach to the character. To do this there is a need to make one's body and voice ductile, malleable, capable of performing metamorphosis. And the mask invites the actor to seek a profound, essential truth. The path starts with the learning of corporal grammars and the discovery of a body intelligence. A new organic expressiveness will be developed. Then, we will continue studying the Neutral Mask, a fundamental step in the experience of the Movement theatre. It is a mask devoid of dramatic expression and which allows the actor to explore a state of pure presence, in the “here and now” of the space. With this mask the actor meets the state of calm that precedes the action. Without a past or future, without memory or design, the Neutral Mask lives in the present, where the gesture is stripped of the drama and becomes pure movement. The actor strips himself of his "private" gestures to find the "common" gesture. With the discovery of this space the actor becomes like a blank page, on which to write future stories. Thanks to the discovery of the neutral state the actor is ready to explore the human forms in motion and thus meets the Larval Masks. They are large masks, with very essential shapes, which suggest the lines of an expression (wide, narrow, elongated, acute ...). without, however, defining the features of the human face. The larval masks are open and available to space and require great gestures to be animated. In the world of larvals everything is always about to begin. We will then continue with the "masks of character" and then the emotional masks to get closer to the expressiveness of an emotion through body language; and again the grotesque masks of the "human comedy" as an approach to the human through the extremization of their own defects. During the internship, students will discover the pleasure of playing within the precise rules dictated by an object. And so, the mask comes to life. 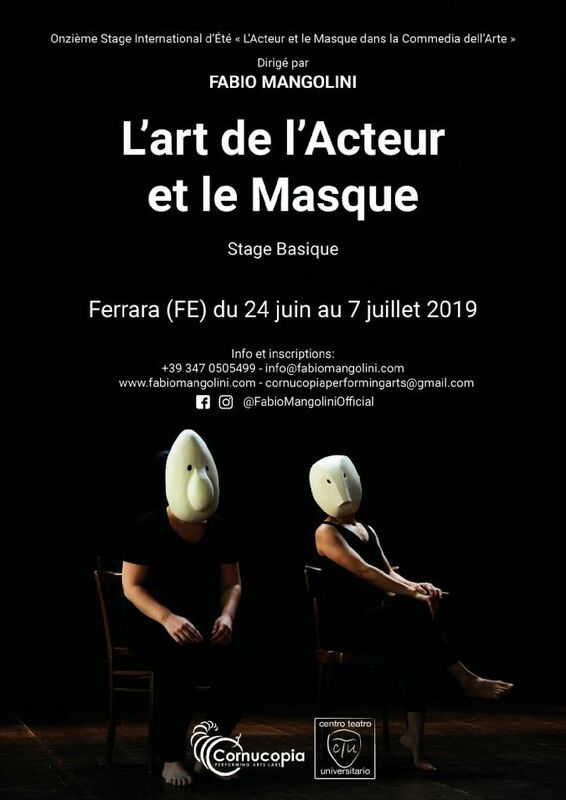 The course is aimed at actresses and actors, theater students, choreographers, directors and all those who intend to approach the world of the mask and physical theater. Duration: From june 24th to july 7th 2019.